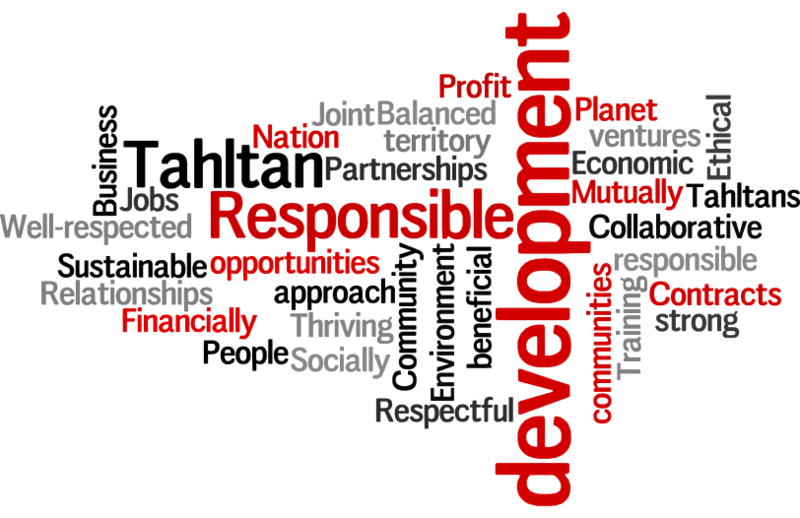 Maintain a profitable organization that generates wealth, economic, employment and training opportunities for all members of the Tahltan Nation while adhering to Tahltan values. TNDC’s vision is to be the leading business corporation and employer of Tahltan members in Tahltan territory. To be a financially secure, self-sufficient and well-respected business corporation by establishing environmentally, economically and socially responsible development opportunities inside and outside Tahltan territory. Integrity: We are honest and fair in everything that we do. Unified: We are committed to working together on a basis of mutual respect and trust. Respect: We are respectful of ourselves, our team and clients. Accountable: We are accountable and responsible for managing TNDC programs and funds while serving our community and clients with open and transparent communications. TNDC is committed to pursuing sustainable economic development and strengthening the cultural wellness of the Tahltan Community by promoting traditional values based on the concepts of caring, sharing, cooperation, truth, honour, fairness and above all, respect. TNDC operations are also guided by the Tahltan Resource Development Policy and the 1910 Declaration of the Tahltan Tribe. These documents affirm Tahltan ownership and sovereignty over Tahltan territory and establish guiding principles that resource developers must adhere to when operating within Tahltan territory.